Preheat oven to 325°. Sprinkle both sides of the brisket with 1 tablespoon of the salt and 1 1/2 teaspoons of the pepper. Heat oil in a Dutch oven over medium heat. Add brisket and cook until well browned, about 5 minutes per side. Remove the brisket to a plate. Whisk together ketchup, balsamic vinegar, cola, chicken broth, onion soup mix, and herbs in a large bowl. Pour slowly into Dutch oven, and scrape the bottom of the pan to loosen any browned bits. Return brisket and any juices to the Dutch oven. Bring to a boil and cover with foil, then lid. Transfer to the oven and cook for 2 hours. After 2 hours, turn brisket over. Add in carrots, then add the chopped onion around the brisket. Replace foil and lid, and continue baking until brisket is very tender, about 1 hour. 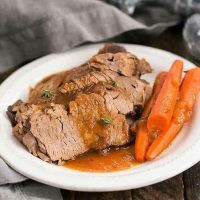 Use a slotted spoon to transfer brisket and carrots to a serving platter. Cover with foil to keep warm. Puree cooking liquid in Dutch oven with an immersion blender to make gravy. Simmer gravy until hot. Stir in bourbon, and season with the remaining 1/2 teaspoon salt and 1/4 teaspoon pepper. Slice brisket then top with gravy and sprinkle with the fresh thyme. Serve with remaining gravy. reheating on the stove and proceeding with the recipe.